When Anne Page first told me she was moving her beautiful Nankeen shop from Tiverton’s Four Corners to Thames Street in Newport, I was psyched. Getting a sneak preview a few weeks ago confirmed my suspicion—it’s a stunning shop and beautiful addition to the Lower Thames Street retail landscape. “Blue” nankeen is an ancient Chinese art form that dates back 3,000 years, originating on Shanghai’s legendary Silk Road (read more about the process here). 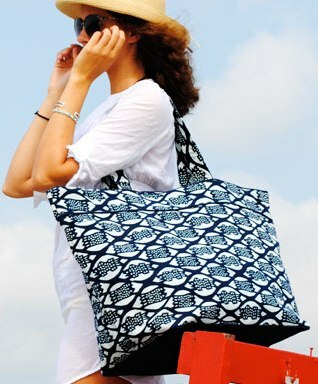 Nankeen now produces stunning blue and white clutches, bucket bags, totes, market bags, weekend duffles, accessories and home accessories like pillows and tablecloths. I brought my Nankeen bucket bag to NYC last summer and literally got stopped twice by strangers asking about the bag (one lady was relentless–she wanted to see the tag so she could write down the name and get it right!). Most bags range from $40-$60 with larger bags (oversized totes and weekenders) averging $80-$130. The new mens line of button down shirts with blue and white detailed cuffs and Nankeen ties ($40) are perfect for summer in Newport. Entry filed under: Uncategorized. Tags: 401-367-1620, 421 Thames Street, 421 Thames Street in Newport, Anne Page, Blvd. skate shop, Blvd. skate shop newport ri, lower thames street Newport rhode island, Nankeen clutch, Nankeen duffle bag, Nankeen mens ties, nankeen process, Nankeen style, Nankeen tote bag, Purse shops Newport ri, Shanghai’s Silk Road, Tiverton Four Corners shops, Tiverton’s Four Corners. Nankeen, Nankeen – how do I love thee! I have so many bags and the way the fabrics are made come through in their quality and styling! SO excited I don’t have to go all the way to Tiverton to buy anymore. Now if we can only get Milk & Honey Bazaar over here, I am all set! Milk & Honey would be a dream here in Newport! Thankfully, la Petit Gourmet is stocking some wonderful cheeses! Nankeen’s phone number is someone elses now and the business has closed down. Thank you, Doug. I’ll delete the number.